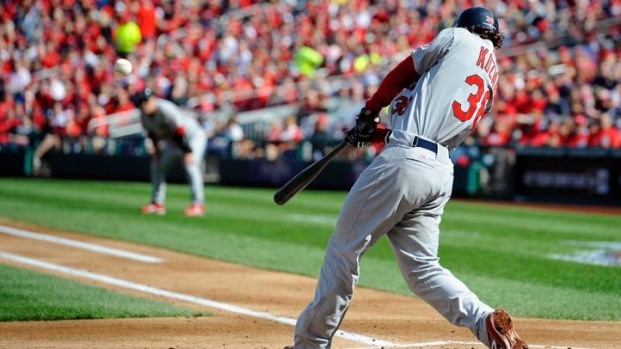 The St. Louis Cardinals blanked the Nationals 8-0 Wednesday in Game Three of the National League Divisional Series, leaving the Nats one game from elimination in the city's first baseball playoffs since 1933. Top 1st: The Cardinals pick up where they left off during Monday's 12-4 rout. Allen Craig smokes a two-out double down the left-field line that makes it all the way to the corner. Matt Holliday chugs home from first to give St. Louis a 1-0 lead. Bottom 1st: Jayson Werth leads off with Washington's first postseason hit in 79 years, which is followed by Bryce Harper's long fly out to deep right field, Washington's first postseason fly out in 79 years. Ryan Zimmerman reaches on an error, which happens to be the first error in postseason play in Washington in 79 years. Adam LaRoche follows that by reaching on a fielder's choice, which is the first fielder's choice in October in Washington in 79 years. Michael Morse strikes out to end the inning, the first...I'll stop. Top 2nd: The second inning has not been kind to the Nationals so far in this series. Gio Gonzalez got roughed up, Jordan Zimmermann got roughed up and now Edwin Jackson is feeling the Cardinals' wrath. David Freese doubles to left. Daniel Descalso then singles to left. With two men on, Pete Kozma hammers a three-run homer to left to give St. Louis an early 4-0 lead. At least Michael Morse didn't have to run after that one? Looking for some positives, people. The Cardinals have scored 10 of their 18 runs so far in this series in the second inning. MLB Network decides to bring up Stephen Strasburg, because of course this is the perfect time to do that. Bottom 2nd: With Ian Desmond on first, Danny Espinosa lays down a bunt and appears to beat the throw to first, but umpire Jim Joyce begs to differ and calls Espinosa out. This is not the first time that Joyce has screwed up a call in that area. He may or may not have cost Detroit Tigers pitcher Armando Galarraga a perfect game once, and by "may or may not," I mean "definitely did." Oh, and the Nationals failed to score. Still 4-0. Top 3rd: Matt Holliday leads off with a single, giving the Cardinals seven hits with only six outs. Edwin Jackson finally gets his first strikeout by fanning Allen Craig and forces Yadier Molina to ground into a double play. Bottom 3rd: Jayson Werth and Bryce Harper both fly out. MLB Network's Sam Ryan explains that Harper's contacts, which "[look] like something out of the 'Twilight' movie," are tinted and serve as sunglasses. Now I can't stop thinking about Harper brooding over some chick that bites her lips too much. Thanks, MLB Network. Bob Costas also makes a "clown question" joke. He laughs at it, but nobody else does. Ryan Zimmerman singles, but Adam LaRoche flies out. St. Louis still leads 4-0. Top 4th: Edwin Jackson strikes out two and seems to be settling in. If only he would have done that an hour ago. Mid 4th: The Racing Presidents reprise their "Gangnam Style" routine and Teddy wins his second consecutive race. If the Nationals don't win the World Series, I'm blaming him. Bottom 4th: Nothing doing here. Still 4-0. It's Teddy's fault somehow. Top 5th: You know you're having a rough day as a starting pitcher when you give up two hits to the opposing starter. Chris Carpenter, who already had a single, takes Edwin Jackson deep to left, but misses a home run by only a few feet and settles for a double. Jackson, however, redeems himself, striking out Allen Craig with runners on first and third to end the top half of the inning. Bottom 5th: Roger Bernadina bats for Edwin Jackson, whose day is done after five innings, eight hits and four runs. He flies out. Jayson Werth walks, Bryce Harper pops out (he is batting 1-for-13 in the series) and Ryan Zimmerman singles to put runners on the corners for Adam LaRoche. LaRoche walks, and with the bases loaded, Michael Morse...flies out. St. Louis holds onto its 4-0 lead. Top 6th: Craig Stammen plunks Yadier Molina to open the inning. David Freese crushes Stammen's offering to deep right. Jayson Werth attempts to make the leaping catch, but his glove just misses the ball and Freese is safe at second with a double. Daniel Descalso drives in Molina from third with a sacrifice fly to make it 5-0 Cardinals. Bob Costas talks about Molina's deceptive speed after calling him "chunky." Chris Carpenter strikes out to end the Cardinals' portion of the inning. Bottom 6th: Ian Desmond continues his hot streak, singling to left center to lead off the inning. He is now 7-for-11 during the series. Danny Espinosa strikes out and Kurt Suzuki flies out. Steve Lombardozzi pinch hits for Stammen and singles, giving the Nationals two runners on with two outs and ending Chris Carpenter's day after 5.2 solid innings. Trevor Rosenthal quells the threat by getting Jayson Werth to fly out in foul territory. St. Louis keeps its 5-0 lead. Washington has left 10 men on base today and 29 in the series. Oofa. Top 7th: All you need to know is that Christian Garcia walked Yadier Molina with the bases loaded to gift wrap another run for the Cardinals. It's 6-0 now. Mid 7th Special Rant: So you know when they sing "Take Me Out to the Ball Game" during the seventh-inning stretch? And you know how the lyrics say, "I don't care if I ever get back?" I personally care. I'd like to go home at some point. I don't understand how none of you want to. Rant over. BONUS TWEET: This wins the day. Bottom 7th: A 1-2-3 inning for Trevor Rosenthal. BORING. C'mon, Nats fans, if you leave, then the terroristsMichael Wilbon wins! The Cardinals add two more runs to take a commanding 8-0 lead. And here come the pretzels. More Stephen Strasburg talk on MLB Network. Bob Costas says "you have to wonder what's passing through the mind of Stephen Strasburg these days." Ryan Mattheus curses loudly. The Nats aren't giving me much to work with here. Bottom 8th: We finally get some "Take On Me" action, but Michael Morse flies out. You're not going to get an A-ha reunion that way, D.C. Still 8-0. Ian Desmond flies out, which comes as a surprise, and Danny Espinosa strikes out, which doesn't. Top 9th: Nothing exciting. St. Louis takes its 8-0 lead into the bottom of the ninth. Bottom 9th: Joe Kelly ends a disappointing postseason home opener for the Nationals by striking out Kurt Suzuki, forcing Chad Tracy to ground out to third and Bryce Harper to fly out to center. St. Louis wins 8-0. That's all for today. Thank you for putting up with me for over three hours. Washington faces elimination Thursday against Kyle Lohse (16-3 this season) at 4:07 p.m. Ross Detwiler will oppose him.